Description: this Tyrannosaurus has long slender legs, tiny teeth and a small head compared to adult Rexes, which is caused by the fact is was originally designed to be a juvenile figure. It does have the odd little two fingered arms seen on larger Rexes though. This figure stands in a neutral pose except for its tail, which is bent to the left somewhat. Its lower right leg hangs a little loose (though still attached) and can be twisted around, as if it’s broken or damaged in some way. The leg cast can be applied to the leg by sticking the pin on its inside in the little hole in the figure’s upper right leg. That way the twisted leg will “switch” back and the animal’s leg is healed; at least, that's the general idea. The Rex’s mouth can also be opened and closed. This animal comes with one piece of capture gear which can cover its head, like a muzzle. It’s coloured shiny metallic grey, as is the leg cast. The Rex itself sports a rather blue look. Except for its underside (throat, belly and lower parts of the tail), which are painted greyish white, and a thick black stripe running from the back of the head over the neck and back all the way to the tip of the tail (and being thickest in the middle where it also runs over the top of both legs), this animal is all light blue, most notably on the head, flanks and limbs. The little Rex is adorned with various grey stripes: these are found on the flanks (two on each flank), the upper legs (three each) and the back (two stripes running from the back of the head to about half way of the tail). The claws on both hands and feet are painted black, while the ridges on these limbs are also black. The eye socket is black as well and harbours red eyes with cat like black pupils. The figure has white teeth. A white JP logo is found on the right upper leg. The Dino Tracker wears a white sleeveless shirt, green trousers with tears on them, and black shoes. He has blond hair, blond eye brows and very bright blue eyes. He has some asymmetric details, including belts around his torso, wristband (right arm), glove (left arm), shoulder patch (left arm) and a backpack with a hole in it so the glider can be attached to the figure: all this detailing is coloured dark brown. Most notably, his left arm can move differently from the average human figure, not only forward and backward, but also up and down. The figure stands in an odd position with its legs wide apart and appears to be looking down. The glider is coloured dark red with silver highlights. It basically resembles a red triangle. The Tracker can carry it on his back, so it appears he's hanging onto it. Analysis: the second JP: Dinosaurs line saw the unusual move on Hasbro's part of pairing its human figures from their JP III line with dinosaur figures from the old Kenner lines. This of course spawned some incompatibility issues, since the style of the human figures differs so much from the style used for the dinosaurs. 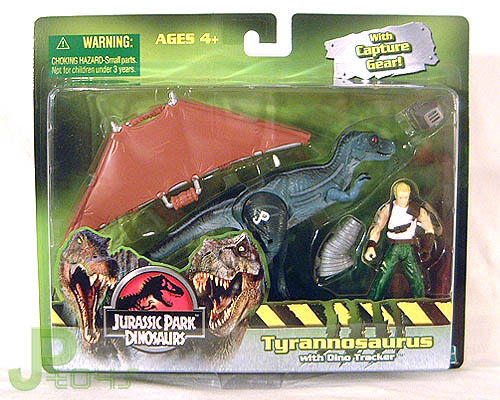 This T-Rex with Dino Tracker set is a prime example of this: the Rex is the old TLWS1 baby T-Rex repainted, but compared to the Tracker it's hardly a baby at all (which is why there's no 'baby', 'junior' or 'young' in the set's title on the package. However, the figure retains its juvenile attributes (long legs, skinny body and overall cute look) which doesn't make it a very successful T-Rex choice for this set. Also, why would the Dino Tracker come with a hang glider when it's primordial companion is a land locked creature? Is he like the Jurassic Park equivalent of the Flying Doctors, scouting things out from the air looking for injured animals? A Pterosaur figure would have seemed a more obvious choice here, or a different human figure. Aside from these issues, this set features decent repaints. The Young T-Rex (that's what it really is after all!) has been given a very interesting and imaginative new paint job, much different from any Rex paint job seen before. Blue hasn't been used all too often for JP dinosaur figures anyway, making this figure stand out amongst its fellow Kenner figures. It's also fairly detailed: claws have been painted, while eye sockets, fingers and toes have not been forgotten. The stripes on its body also add some diversity to this paint job. The only nuisance is the white JP logo which looks hideously out of place. Apart from the paint job, there's nothing new to this figure. It's still the same good old Junior T-Rex with its previous pros and cons. The Dino Tracker is less of a success. It's nice to see him as a blonde this time around, but the white shirt looks ugly. The green pants, with the scratches and the various shades of green mixed in so it looks more detailed, make up for it somewhat. It's a good thing the alternatively poseable arm has been retained, since this feature makes the figure unique among JP human figures. Unfortunately, the figure stands in the same odd pose as before, which makes it look silly when it's attached to the glider. The glider itself sports a rather boring paint job, also very similar to its previous incarnation. It wasn't until JP 2009 until a Hasbro designer had some fun with it and made it look much more different, as well as way cooler. All in all, it's clearly the T-Rex is the main draw of this set. The Tracker has some minor redeeming features but is little more than an accessory. Luckily the Rex has a rather small mouth and isn't in pristine physical condition so his human counterpart won't get chewed on too much... At least he can take to the air for refuge. Repaint: yes. This is a repaint of the TLWS1 Junior T-Rex, with repainted accessories from that same figure. It was repainted twice before for JPD1. The Dino Tracker is a JP III Billy Brennan repaint with repainted glider, a first time repaint. Brennan would be repainted again (with glider) for JP 2009, but this would be the last time this T-Rex figure got released. Overall rating: 7/10. This Young T-Rex sports a rather original, appealing and detailed paint job and remains one of the most movie accurate sculpts. The Tracker is a half decent repaint of an imperfect figure with an unimaginatively painted glider. Like all four dino/human 2-packs, this is one of the more common JPD2 releases, and it can still be found without too much difficulty, though these days prices tend to vary.